Optima Pomegranate Juice is made from pure, unrefined, Pomegranate juice, a naturally powerful antioxidant. Research shows that pomegranates contain free radical scavenging antioxidants which help the body's natural defence system fight oxidative damage. Pomegranate juice is suitable for those on a low cholesterol diet and may help maintain a healthy heart as part of a balanced diet. Concentrated double strength Pomegranate fruit juice, Ascorbic Acid, Potassium Sorbate, Sodium Benzoate. 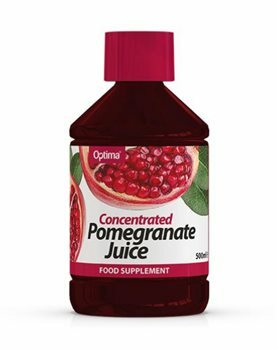 Optima Pomegranate juice can be taken direct from the bottle (20ml serving) or, if preferred, can be diluted to taste. Avoid use whilst pregnant or breast feeding. Not suitable for infants. Shake well before use. Refrigerate after opening and consume within one month. Delivered in under 24 hours. Can't ask for better.